Here are a couple of threads in the fabric of lighting control that weave through this year's Lightfair. I spoke with Gerard Harbers, CTO and co-founder of Xicato. The company that made its name with LED engines of groundbreaking color accuracy and consistency has been broadening its focus to encompass lighting controls. It got there by a singular path. Accurate color was the original and continuing passion of the Xicato founders when they opened up shop seven years ago. They went so far as to develop their own testing regime to guarantee that the longevity and color of shipping products was known to closer tolerances than standard testing could guarantee (they still rely on these more stringent tests today). Not content with selling LED engines guaranteed to be within a 1x2 Macadam ellipse of the target color, Xicato determined to guarantee that color over time. Even all these years later, standards for color shift have not been established industry-wide. But Xicato decided that it could issue a 5-year warranty, now backed by Munich Re insurance, to assure that the color point of one of its LED engines would not wander further than 3 Macadam ellipses from its starting point. In service of guaranteeing 50,000 hours of useful service life, Xicato instrumented its light engines to record and report temperature over time. This historical record per engine allowed them to project remaining lifetime to an accuracy of 5%, according to CTO Harbers. 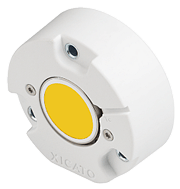 Once they had a microprocessor and memory on board, it was a series of incremental steps to the Xicato XIM module, which includes an integrated LED driver, on-board dimming capability, self-diagnostics, sensors, and connectivity... and behold, Xicato had backed into the regime of smart lighting by way of quality monitoring. Harbers told me that the highest-end retailers, the likes of Armani and Hermes, are all over Xicato's Vibrant series lights because, not only do they produce colors verified in a scientific study to be more appealing to shoppers, but also the engines can be instrumented to allow analytics on the movements of customers. We are going to see a lot more of this as the technology trickles down. Xicato has begun partnering with others in the space of lighting control systems. A deal with Digital Lumens was announced at this show, and others are in the works. I haven't gotten over to the Hubbell booth yet to see this product; I hope to do so today. [Added 2014-06-04, 21:30 ET] I did go and stand under a TOTUS-equipped lamp post in the Hubbell booth; see the image below of the UI on a tablet. 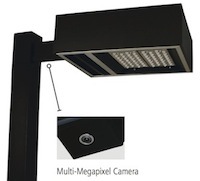 Hubbell brand Sterner Lighting is working with TOTUS to offer active security monitoring built into light fixtures, featuring "video surveillance, two-way audio communications, and advanced site analytics." 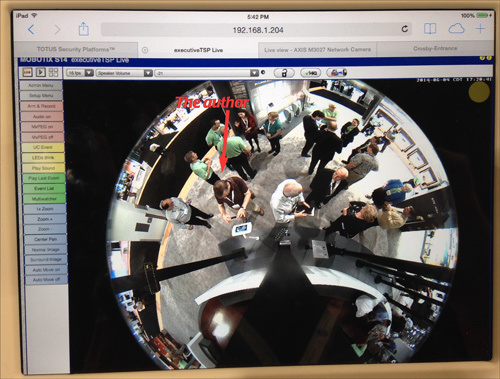 The system utilizes a hemispheric 360° view camera with recording and real-time viewing along with two-way audio for live listening and communication via an amplified speaker. Fixture-to-fixture data transfer takes place over a 900-MHz wireless auto-mesh network. It's strangely appropriate that this security-aware lighting is being introduced in Las Vegas. This city made headlines late last year by being among the first to install such surveillance gear on light poles. [Added 2014-06-04, 21:30 ET] Below is the full 360° view of the camera's interface. It can display other views, such as a "fimstrip" of the undistorted wedges. You can set up active zones in which events (such as motion) will trigger responses (such as a voice from the speaker, turning on or flashing lights, sending a text or email to a predetermined address, or even an SIP phone call with attached video).